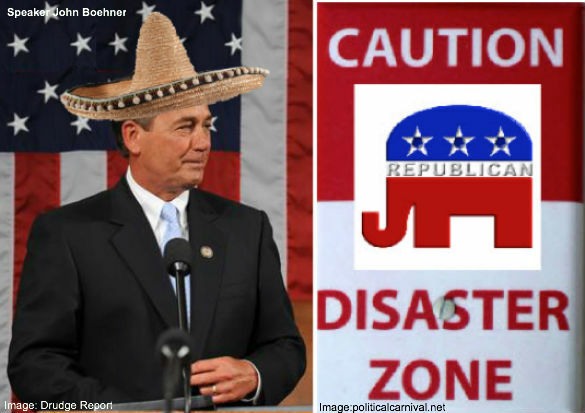 Rep. Steve King (IA-4) said much the same thing back in July 2013 when he told WND’s James Simpson that “About half or so of the [House Republican] Caucus understand we are on suicide watch over the Republican Party,” following a caucus meeting where House “leaders” pitched amnesty. Republican National Committee Chairman Reince Priebus, is so out of touch with the grassroots of the GOP that, according to David Sherfinski of The Washington Times, he recently said that there’s a “general consensus” in his party that something big needs to happen on overhauling the country’s immigration laws. And of course Boehner, Cantor, McCarthy and Ryan are (as usual) responding to the ethnic pressure groups and special interest money from the US Chamber and the cheap labor wing of the business community that are flooding Capitol Hill right now. But in this case a Republican suicide equals national suicide. The only thing standing between the death of the American middle class, and the culture of American exceptionalism that created it, is a handful of principled conservatives on Capitol Hill. Chief among the defenders of American exceptionalism and one of the few senior Republicans on Capitol Hill who seems to be listening to the grassroots of the GOP is Senator Jeff Sessions of Alabama. Earlier this week Senator Sessions' staff hand-delivered to each Republican member of the House an important memo on the so-called immigration reform bill being debated on Capitol Hill. "Coordinating with a small group of the nation’s most powerful special interests, last year President Obama and Senate Democrats forced through an immigration bill which can only be described as a hammer blow to the American middle class,” said Senator Sessions. “Not only would it grant work permits to millions of illegal immigrants at a time of record joblessness, it would also double the annual flow of new immigrant workers and provide green cards to more than 30 million permanent residents over the next decade. These new workers, mostly lesser-skilled, will compete for jobs in every sector, industry, and occupation in the U.S. economy." Bill Kristol, editor of The Weekly Standard, recently urged the GOP to abandon this newest immigration push, saying that “the guiding principle should be do no harm.” Instantly legalizing millions of new workers would of course do enormous harm to the struggling and the unemployed. More American energy that creates good-paying jobs right here in the U.S.
A more competitive tax and regulatory code that allows U.S. businesses and workers to compete on a level global playing field. A trade policy that increases U.S. exports and expands domestic manufacturing. An immigration policy that serves the interests of the American people. Converting the welfare office into a job training center. Making government leaner and more accountable to U.S. taxpayers. Restoring economic confidence by continuing our effort to balance the federal budget. An all-out immigration push is inimical to these goals says Senator Sessions and we agree. As Jeff Sessions wrote to House Republicans: “Republicans should honor our clear duty to defend the core interests of the American workers who form the backbone of this nation. And they should tell the President’s CEO lobbyists, loudly for all to hear: we don’t work for you; we work for the American people.” Click here to demand your Congressman sign our "No Amnesty Pledge" today. Submitted by Karen Wainio on Fri, 01/31/2014 - 13:40. Don't get mad. Get even. The uber-RINO, deceitful, establishment tool Eric Cantor has a serious, well funded authentic conservative primary challenge THIS JUNE. Go to www.davebratforcongress.com. Donate, volunteer, get involved. Cantor has lots of money from his handlers on K Street, Wall Street and Silicon Valley. They own him. But he's got clay feet. His constituents know he's a phony and are mobilizing. Don't sit this one out. Help to retire the sell-out Eric Cantor now. Submitted by David Givens on Thu, 01/30/2014 - 15:32. How to Solve Our Illegal Immigration Problem! Our borders are open. One to three million invaders flow across our southern border every year. There are an estimated 20 to 40 million invaders in this country already. Congress is now dominated by a bunch of lily-livered liberal Democrats. They are opposed by a bunch of linguini-spined conservative Republicans and cowardly liberal RINOs. All three groups want to grant these invaders amnesty under another name. They want to set them on a “path to citizenship” which hopefully will make them grateful Democrats. Or they want to “regularize their status” which hopefully will keep them working at substandard wages in Republican-owned businesses. First, immigrants are, for the most part, hard-working people. Most of them are Latinos, who are Catholic. These immigrants, whether Latino or other, are not likely to buy into the Democrat pro-abortion welfare state. If they become citizens, most, will eventually become Republicans. Second, if we “regularize” their status they are no longer illegal. They don’t have to work for substandard wages. They will demand what the traffic will bear to do the work. To maintain the cheap labor the Republicans want they will have to bring in a whole new bunch of invaders. This, of course, is their plan. The overwhelming majority of Americans — liberals, moderates and conservatives; Democrats, independents and Republicans — want this stopped. This is a relatively easy thing to do. It can be done in two phases. The most difficult aspect of this plan is making it happen. There is only one force on Earth that can make this happen — We the People! So forward this message to all of your acquaintances and call them in a couple of days to encourage them to join grassrootsvoters.org. Phase One — Close Our Borders! The first thing we need to do to solve our illegal immigration problem is close the borders. 1. Build a double fence along the entire U.S. southern border. A fence will not prevent invasion but it will make it much more difficult. These fences will be set up on two berms that run right along the border. The two berms will be at least 500 yards apart. The fences will be at least ten feet high and topped with razor wire. The southernmost fence will be completely screened to prevent potential invaders from observing activity between or beyond the fences. There will be sensors along the entire route to detect surface and underground movement. There will be video cameras spaced to provide over watch of the entire border. There will be Border Patrol stations inside the fences spaced at intervals that will allow them to respond to breaches in the fence promptly. The monitors for the video cameras will be in the border patrol stations nearest the camera. When an incursion is detected, the nearest border patrol stations will coordinate a response. The open borders whackos will claim that we cannot afford the expense. Nonsense! This will cost much less than a highway of the same length and it is much more important. It can be built by Army combat engineers as a part of their training — a necessary expense that we already incur. Some people would like to build a “virtual” fence. This is a good idea but not instead of a real fence — in addition to it. 2. Establish a military desert patrolling training area along the U.S. southern border. This area will be at least 100 miles wide. Many will object to the cost of this land acquisition. Most of this land already belongs to the U.S. government. Most of the owners of the privately owned land will be happy to cooperate if they are compensated for any damage that the military training activities cause. The land of any who are unwilling to cooperate can be condemned and turned over to the Department of Defense. Marine, Navy, Air Force and Coast Guard personnel will train in patrolling and ambush techniques in this area. Their training will, of course, be directed at locating, ambushing and capturing “opposing forces,” other members of the Armed Forces who are pretending to be the enemy. The trainees and OPFORs will inevitably come across terrorists, drug smugglers, illegal aliens and other invaders. Part of their training will be to locate and detain invaders and turn them over to the appropriate authorities. The Supreme Court should conclude that the defense of the border from invasion is “authorized by the Constitution.” But who knows what kind of fatwa the nine idiots of the Supreme Court will hand down. If the Supremes do not think the constitution authorizes defense of the border, Congress can act. The military has lots of sensing toys. All American Armed Forces have a wide variety of surveillance equipment from satellites to manned reconnaissance aircraft to unmanned drones to viewing and listening devices. The Air Force can provide satellite and aerial reconnaissance of the border. The Navy and Coast Guard have various radar and sonar that they can use to observe coastal infiltration routes. The Army has unmanned drones, various ground listening devices and other sensors. All operators of these surveillance devices require training. This training will be concentrated on observing our borders. Ground forces (SEALS, Marines and soldiers) from basic trainees to experienced warriors, about to be deployed or redeployed to Wherever, will practice their ambush, patrolling and reconnaissance skills in the desert patrolling training area. As a part of this training, the Air Force will observe opposing forces and pass the information along to the ground forces. The ground forces will monitor OPFOR movements move ahead of them and set up ambushes. As a part of their training in reconnaissance and patrolling, the Air Force will detect everyone on the border. They will inevitably detect invaders. The information will be transmitted to the ground forces. These invaders will be detained and turned over to the appropriate authorities. These two simple steps will reduce illegal immigration to a trickle. Phase Two — Send Invaders Home. The open border amnesty crowd says you can’t round up 20-30 million illegal aliens and send them home. Nonsense! Most of these invaders will go home on their own if we do two things — remove the financial incentives that draw them here and make getting caught draconian. 1. We have laws on the books making it illegal to hire illegal aliens. We need to strengthen and enforce the law. Make management responsible. Make the punishment for allowing an illegal alien to work on your property or in your business up to a $10 thousand fine and up to a year in prison for every incident. Define an incident is any day that an illegal alien was working on the property. Make everyone who participated in the employment liable. Subcontracting a service is participating. In a RICO (Racketeer Influenced and Corrupt Organizations) Act-type provision make the possible confiscation of the subject business and property a provision of the law. Additionally, any company that is convicted of hiring an illegal alien is barred from contracting or serving as a subcontractor for the federal government, any of its subordinate jurisdictions or any company that supplies an American government. Any individual who is convicted is permanently barred from employment by an American government, or any company that supplies an American government. That will get the attention of managers, employees and stockholders. THEN ENFORCE THAT LAW! Open an enhanced e-verify web site that will allow an employer to put an employee’s social security number into the system and find out the name, age and employment history of the person who holds that social security number. If John Doe works for you or applies for a job, you put in his S.S.N. If it turns out that the S.S.N. is fake or belongs to someone else you fire him or don’t hire him. If Doe is dead, you fire him or don’t hire him. If he is currently employed somewhere else you call his other employer and find out why. Give employers a 30-day window to ensure that all employees are legal. Then set the I.N.S. on them. The I.N.S. could first raid all of the plants of a major food processing company — an industry that is notorious for ignoring immigration law. Seal the exits and search the personnel computers. Run the S.S.N.s. If there are illegal workers in any of the plants arrest them, all of the human resources workers and the entire chain of command above H.R. They would each be liable for up to a $10 thousand fine and up to a year in prison for every day each of these illegal workers has worked for the company. Have a big public “perp walk.” This will send a message to management of other companies. Instantly, large American companies will get rid of illegal aliens. But there aren’t enough I.N.S. agents to raid every business in America. 2. Let’s get some bounty hunters! Bounty hunters have the authority to search private property and arrest people — all without regard to rights guaranteed by the constitution. We need a similar law for illegal immigrant hunters. Private citizens can be deputized by the I.N.S. A deputy would have the authority to require the owner, employer and employees working at any location to prove that everyone working on the property is legal. He or she would have the authority to arrest, cite and establish bail/fine. He or she would also have the authority to collect a check payable to the U.S. Treasury and take the property of anyone whose check bounced. A deputy wanders around taking pictures with his cell phone of the people working on a property. With this evidence that a business or farm has people working on the property he speaks to the owner or manager. He shows his evidence to the owner or manager. If, by going on the Social Security website, the owner or manager cannot prove that all of the workers are legal, the deputy gives him a summons and sets a fine/bail — the maximum he thinks the owner can afford. The owner can write a check to the U.S. Treasury and either go to court or forfeit the bail. The Treasury cashes the check and sends half to the bounty hunter. If the cited person wants a trial, fine. He will be prosecuted for all infractions the I.N.S., I.R.S., S.S.A. and F.B.I. can find. Most will forfeit the bail. If the check bounces, the deputy takes the business and the property. If a deputy notices that his next-door neighbor has hired someone to mow his lawn, he takes a picture of the guy working and asks the homeowner for proof of legal employment. If he doesn’t get it, he collects a fine/bail from the homeowner and sends the check to the Treasury. If the check bounces the deputy takes the house. 3. Withhold federal funds and grants from any state that does not require all of its agencies and its subordinate jurisdictions to enforce U.S. immigration law. Some cities and states forbid their employees from reporting illegal aliens to the appropriate authorities. Some even forbid inquiring into immigration status. This is probably illegal. Officials swear to enforce the laws of the city, county, state and United States. They should be required by law to enforce immigration law. Any state that does not require all of its employees and the employees of subordinate jurisdictions to enforce U.S. immigration law should not be allowed to participate in federal largess. To enforce immigration law, all they have to do is report to I.N.S. anyone that they come across whom they suspect of being an alien — it is I.N.S.’s job to establish the status of that person. This program would make it virtually impossible for an illegal alien to work in the United States. Most will immediately leave. Make it a felony to be in the United States illegally punishable by a mandatory $10 thousand fine and a year in prison. Anyone convicted of a misdemeanor or felony should be forever barred from entry into the United States for any reason. This will stop illegal immigration by discouraging the illegal aliens from coming to or staying in the U.S.
1. In 30 days we will begin a huge round-up of invaders and those who employ them. Invaders are likely to be caught. They definitely will not be able to find employment. 2. People caught in the country illegally will be required to serve a year in a work camp, fined $10,000 and then deported. 3. When we have control of our borders and our immigration policy we will institute a guest worker program. People caught in the country illegally will be convicted felons and therefore not eligible to visit to the United States under any circumstances. All intelligent invaders will immediately make arrangements to go home. They will not need assistance with this. The got here on their own. They can get back on their own. If they are in Maine or even Alaska, they have 30 days to get back to Mexico — they can walk, if necessary. Or, namby-pampy bleeding heart liberals can buy them a bus ticket. Those who are caught by the I.N.S. or deputies in raids will go to a work camp where they may be employed by the bureau of prisons to work in the industries in which they have been employed to help alleviate the shortage of workers in that industry. The wages charged the employer by the Bureau of Prisons will be significantly higher than those required to hire a legal worker. Those who cannot be employed in the industry they were working in can be employed as farm workers — again at wages considerably higher than those required to attract legal workers. Once they have served their year, paid their fine and expenses they will be deported and forever barred from entry into the United States. The money that the Bureau of Prisons collects as wages for these workers will be used first to defray the cost of imprisoning them and then to pay their fine. The cost of imprisoning them will be as modest as possible. Most will be held in extremely low security facilities — a collection of tents surrounded by barbed wire. The food provided will be modest but wholesome — a lot of beans,rice and vegetables. Any who are found outside their assigned facility will be reassigned to progressively unpleasant accommodations and jobs. This will remove most invaders from our country. At this point there is only one economic draw for illegal aliens — crime. Those who came here to pursue a life of crime are still here. We make any deported invader who commits a crime in the United States subject to mandatory execution. Most criminals are too stupid to foresee future outcomes. They will probably have to work off their fines as members of a chain gang. As they are arrested, tried, convicted and do their time, including the extra year and fine for their illegal status, they are deported. If they are not convicted of the crime for which they were originally arrested, they serve their year, pay their fine and are deported. If they are not tried for the crime for which they were originally arrested, they serve their year, pay their fine and are deported. Gradually we will get rid of them. If any deported invader ever commits a crime, in the United States, we execute him. If we truly cannot find people to fill unskilled jobs that liberals and RINOs say, “Americans will not do,” the I.N.S. has procedures in place to bring in temporary workers. Follow those procedures. They should be modified, where necessary, to ensure that they do not lead to permanent residence or citizenship. If a person wants to immigrate to the United States he should follow established immigration procedures and wait his turn. While he is waiting he may be able to participate in a guest worker program. Under no circumstances should a guest worker program be implemented until this proposal has been successfully implemented. First, we need to ensure that Americans will not do the job; not that Americans will not do the job at a price the employer wants to pay. Before an employer can apply for guest workers, he must pay for help wanted ads processed through the Department of Labor. These jobs should pay the prevailing wage for similar work. For example, if carpenters get $100 per hour in an area, the employer should have to advertise the job at $100 per hour. If we cannot find sufficient workers, the employer can bring one member of a married couple into the country to fill the job on an 11 month contract. He must pay the agreed upon wage. All workers must be married and remain married for the duration of their contract. They are coming here to work not look for a mate and settle down. Under no circumstances will both spouses be allowed to participate in the guest worker program at the same time. No dependants may be brought. Any female worker who gets pregnant will be returned to her home country by her employer until her baby is born. There will be no “anchor babies.” In fact, the whole concept of “anchor baby” should be done away with. At the end of the contract, the worker must return to his home country to reapply. During that month, the employer must again advertise through the D.O.L. for an American worker. Traditionally, illegal aliens have worked in agriculture. A farmer who needs a full-time worker, can follow the procedure above and hire a worker for 11 months at a time. The problem with farm work is that it is seasonal and of short duration. In the spring, farmers want someone to plant their crops. In the fall, they want someone to harvest their crops. Most crops are planted and harvested by contractors who, of course, hire illegal aliens. These contractors would have to get contracts to harvest crops arranged from south to north. Crops mature from south to north so the contractor will have to plan his itinerary and write his contracts. He can determine how many workers he will need for how many months and advertise the jobs at a wage determined by the D.O.L. to be appropriate to hire American workers. The homeless and unemployed should be encouraged to take these jobs. The shortfall can be filled from outside the country on 11 month contracts. Of course, the contactor will have to provide, transportation from site to site, housing at the site and food. This shall not be deducted from the worker’s wage. A contractor would have a fleet of trucks, camp trailers, tents and buses. He would transport his workforce in buses. They would set up a campsite on the property where the harvest is to be conducted. His workers would harvest the crops while eating and sleeping in the camp. When the harvest is gathered, the contractor gets paid and moves to the next site. D.O.L. will have to supervise this program closely to ensure that the workers are not abused. In addition to a reasonable wage, employers will have to pay for the transportation of the worker from and back to his home country every year. He will be without that worker for one month a year. It will be much cheaper to hire an American worker. He will increase the wage and improve working conditions. We will probably find out that there are not many jobs “Americans will not do” — if you pay them fairly. The most difficult aspect of this plan is making it happen. There is only one force on Earth that can make this happen — We the People! So forward this message to all of your acquaintances and call them in a couple of days to encourage them to call their Congress Person and Senators to make it happen. The way to make this happen is to first remind the representatives, senators and president that they work for us. Then we fire the ones who don’t take the reminder seriously. Join grassrootsvoters.org. Grassroots Voters will form a network of grassroots voters political action committees — one in every congressional district. If money is the mother’s milk of politics, votes are its lifeblood. Unlike other PACs we do not give money — we deliver votes. Each Congressperson and Senator will get a letter instructing him or her to introduce, actively support and pass all eight points of the Grassroots Voters program. Before our state caucuses or primary elections we all join the party of any incumbent who did not follow our instructions and put another candidate, who has agreed to support our program, in his or her place. We then ask the candidates from both parties to promise to support our program. And, in the 2008 general election, we all support and vote for the candidate who promises to force our program into law. Any who do not support this program we hound out of office. We continue to actively work against these legislators who do not understand for whom they work year after year until we have gotten rid of them. Even after our program is law and implemented, we oppose them. No matter what good things they promise or do, we oppose them. We oppose them until they get a real job and out of our government. We the people are the only ones who can make this happen. Let’s do it! DEAR CONGRESSMAN: STAND DOWN NOW !! Submitted by sir_aslan on Thu, 01/30/2014 - 15:00. American citizens are not obligated to give citizenship and benefits to people who decided to invade our country and now expect us to feel sorry for them. Your duty is to AMERICAN citizens. Republicans don’t want to extend unemployment benefits, yet they are willing to flood the country with cheap Mexican labor??? Driving down wages and increasing competition for available jobs? All this because business interests want higher profits and don’t care if America is reduced to a third world country? Read my lips….Dems aren’t the problem. Quisling Republicans are the problem. Both parties have sold out the American people. If you vote for amnesty I’m done. Let the other side kill the country. I’ll never vote for another Republican and I won’t be blackmailed by the lesser of two evils. The person who says they’re my friend and stabs me in the back is the EVIL one. I will never again vote for a republican if you guys pass this latest amnesty bill. You guys didn’t stop your pay raise. I suppose it’s hard to get by on 174K/yr.? The average full time minimum wage earner makes about 15K/yr. Republicans are against extending unemployment benefits? At the same time you want to flood the country with cheap labor from Mexico further driving down American wages and available jobs. The drivel that we just need to get an education is also BS, because business wants to give those jobs away too. More HB-1 visas are included in this bill. HB-1 visas have been successful at holding down the wages of our most skilled workers. It’s a lie that there aren’t enough American’s to fill the positions. Data shows many people graduating from tech schools are not getting jobs in their fields. Americans will be competing with Mexicans for jobs at McDonalds. There will be a stampede over the border. “David Rockefeller enthused, “Everything is in place-after 500 years- to build a true ‘new world’ in the western Hemisphere.” In the Los Angeles Times, Henry Kissinger provided his own perspective: NAFTA will represent the most creative step toward a new world order taken by any group of countries since the end of the Cold War, and the first step toward an even larger vision of a free trade zone for the entire Western Hemisphere…NAFTA is not a conventional trade agreement, but the architecture of a new international system. Republicans are going along with the latest fast track screw job, TPP. Think Mexicans are going to vote Republican? Go ahead and kick the base to the curb. We’ll see how that turns out. I won’t be held over the barrel any more with the lesser of two evils. IMO Republicans are the evil ones. I expect Dems to do stupid things. The ones who say they are conservative and my friend but are working against me are the evil ones.